This entry was posted in For Pastors and Teachers, Humor, Quips and Quotes and tagged ego, funny, humility, Matthew 23:12, peacock, pride, self-centered. Bookmark the permalink. None of us is large and in charge, for all time. The Christ allowed Himself to be humiliated, not only to heal our collective wounds, but also to impart a real-time message, illustrating what St. Matthew would write, on His behalf. I find myself much more often in the feather duster role, than the peacock role. But the good Lord knows what I need. And I try (not always succeeding) to have a peacock attitude even when I’m being used as a duster. 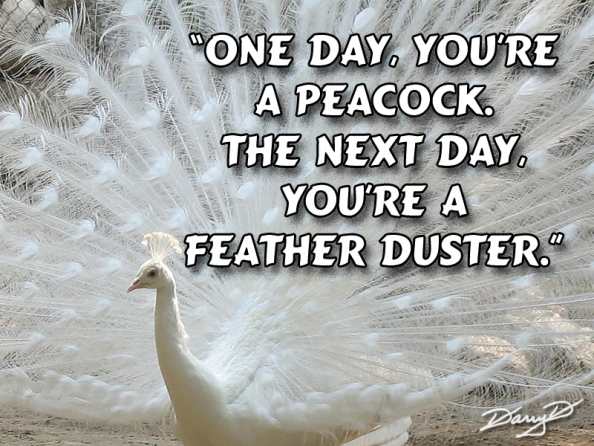 As a nurse reminded me last time I was in the oncologists office for a check-up (and celebrating 12 years since battling 4 different cancers, two of which were stage 4), “God is good; all day, every day.” Besides, we NEED dusters; peacocks are just for pleasure once in awhile. Another great post, Mitch. Thanks for sharing your insights with the rest of us. LOL!!! What a great paraphrase. That should bring some of us down a notch or two. Ha! I like the way this is phrased. Thank you for this excellent point! Love it ! I always look forward to your creative posts! We are going through a transition now from overworked indispensable in our church and with our friends to being the unknown older couple in the crowd. It feels like feather dusters are way more useful right now. But God has a plan for all of us and only He defines what is really useful! Well said, and absolutely true.